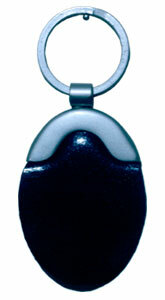 A leather key fob with a frosted metallic key holder. The model can be made in different types of leathers like Cow Polished, Cow Nappa, Cow Vegetable, Buff Resin, Buff Glazed, Buff Vegetable and Cow Softy. The colours available are black, blue, brown and shades of cognac and burgundy. A leather bag for the Doctor. 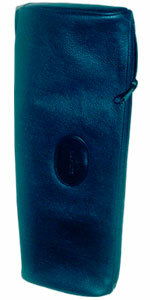 The bag is 37 x 12.5 x 6 cm and is cylindrical in shape. It can fit the Stethoscope, a small blood pressure monitor and a notepad. It is very convenient. We have put the latest Litmann Stethoscope and it fits comfortably. Available in our standard leather types and colours. 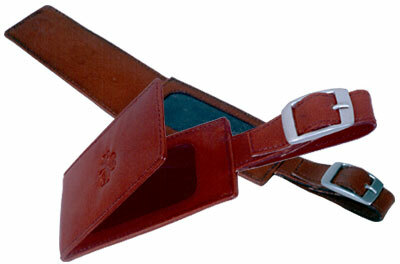 Description: This specially designed luggage tag has a buckle and belt system for attaching itself to the suitcase. It has a hidden magnetic closure for the flap which can be pulled up for viewing the details of the owner. The size is 10 x 5.25 cm. As you can see it is tapering to 4.5 cm. The model can be made in different types of leathers like Cow Polished, Cow Nappa, Cow Vegetable, Buff Resin, Buff Glazed, Buff Vegetable and Cow Softy. The colours available are black, blue, brown and shades of cognac and burgundy. 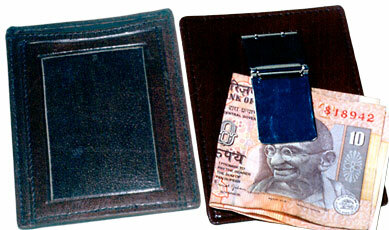 Description: A leather money clip holder of size 8 x 10 cm. There is a metal clip with a roller system for holding on to the paper money. There is one pocket in the side and a transparent window pocket. The model can be made in different types of leathers like Cow Polished, Cow Nappa, Cow Vegetable, Buff Resin, Buff Glazed, Buff Vegetable and Cow Softy. The colours available are black, blue, brown and shades of cognac and burgundy. 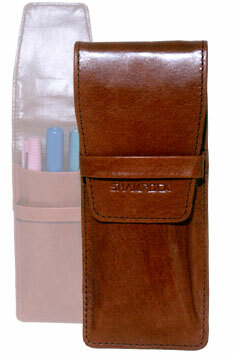 Description : A leather pen case to accommodate three pens. The size of this model is 16 X 7 cm. The model can be made in different types of leathers like Cow Polished, Cow Nappa, Cow Vegetable, Buff Resin, Buff Glazed, Buff Vegetable and Cow Softy. The colours available are black, blue, brown and shades of cognac and burgundy.